I’ve got a big bowl of health for you today. It’s disguised as a hug. It is! I swear. This is a big deal. There are no noodles in this soup! I didn’t even realize it until I was halfway done testing the recipe. I actually meant to add noodles but my new years brain is completely fried and before I knew it, I saw a bunch of green, took a taste, and was all… perfection. As long as you like mushrooms! If you don’t, you can totally leave them out. You can actually put whatever the heck you want in this pot. Even noodles. I won’t judge. This one though? It almost reminds me of a big bowl of ramen without the, well… ramen. Toasted sesame oil. I could just drink it! A splash of rice vinegar. And a sprinkle of furikake. I dieeee. We also gotta talk about how awesome this soup is for this time of year. This past weekend, I came down with the flu. 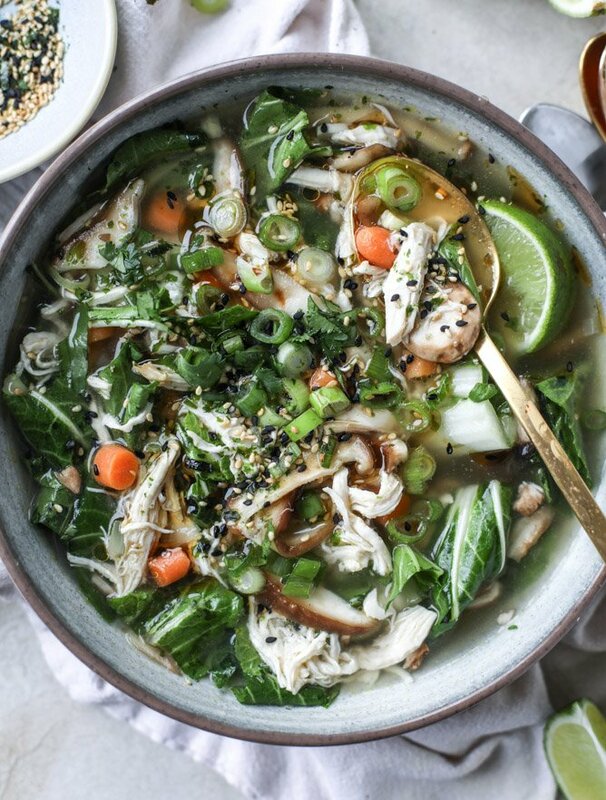 I don’t think I’ve ever had the flu before, like the real, legit flu, and alllll I wanted in life was a bowl of this soup, after I woke from the dead after 48 hours. It’s calming and delicious and seriously full of vegetables which I don’t even notice because the flavor is fantastic. And the best part is that the flavor is sort of up to you with all of those toppings. More sesame? Yes of course. You can put whateverrr you want on it. It also has some texture, because the bok choy retains a bit of crunch since you add it near the end. SEE. You don’t even need noodles! If I say so, you can trust me. Heat a large pot over medium heat and add the olive oil and butter. Stir in the onion, carrots, salt and pepper, cooking until softened, about 3 minutes. Stir in the mushrooms and garlic, cooking until the mushrooms just soften, about 3 more minutes. Add the stock and bring the mixture to a boil. Reduce to a simmer and cook covered for 10 minutes. Stir in the chicken and bok choy, simmering for 10 more minutes. Right before serving, toss in the green onions. Serve with toppings of cilantro, toasted sesame oil, tamari, rice vinegar and furikake seasoning. Now that I’ve met my vegetable requirements for 2017, I’d like a cookie. Please and thank you. on the couch, while eating this. It works. I have a very similar recipe written down under my “recipe ideas”–LOVE this version though and these photos are gorg. This looks like a big bowl of comfort! I was craving soup yesterday, but feeling burned out on my usual recipes and unmotivated to search for another, so my laziness thanks you! It sounds really nurturing, too. I don’t think I’ve ever had the legit flu (I hear that you definitely KNOW if you’ve had it). I hope you are on the mend and back among the living!! Such yumminess! I could devour a huge bowl of this right now and I so want to! Gotta make this. This soup sounds soo amazing, Jess! Warm and comforting, perfect for these winter days. It’s been raining so hard lately and so cold too. I think this would be the perfect meal for this weather we’ve been having. I’m battling a cold right now, this is perfection at the perfect time. I needed soup so bad yesterday, but to weak to make it. A wonton soup from the closest Thai rest had to do, but making this asap. Thank you. Hope you are feeling better! So funny, I was planning on making almost the same thing tonight for dinner (with noodles!). You forgot the best topping — eggs!! Yum! I am seeing Asian soups across so many blogs right now. Yum! This looks so comforting and healthy! WOW, this looks sooo delicious! And definitely is called for after having the flu. I hope you are on the mend! I guess that crud is going around! This soup looks amazing! I need this in my life! Smart woman. You know your readers would be like whoa that looks delicious, amazing, exotic… yet I’m intimidated because it must be complex to make….but hey look it sounds so much more approachable with ’30 minutes’ in the title…so I’m gonna give it a shot. Love ya! 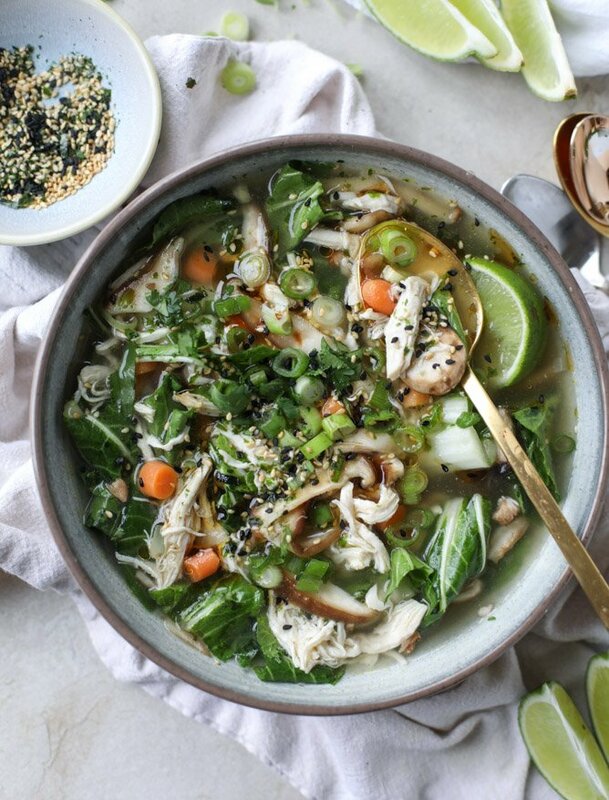 Your Chicken soup recipe is very healthy and healpful for cold and flu. Tast of this soup is yummy. It’s like you knew what was leftover in my fridge. I added tons of fresh ginger and put the tamari and rice vinegar right in the whole pot at the end. I topped it with a little spicy kimchi. No noodles needed! Thanks for the inspiration! Made a variation of this tonight (added fresh ginger and noodles). 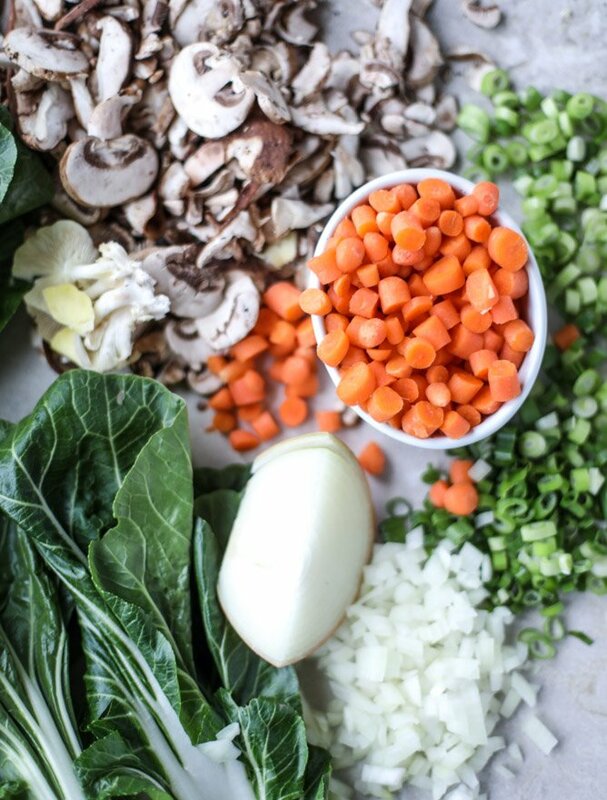 Love the texture of the bok choy. Turned out soooooo great! Make it all the time. The family loves it! I had everything on hand to make this except for the mushrooms, so I left them out. It was so full of flavor, and completely filling without being heavy. I used a little bit of most of the toppings you suggested, and they really did enhance what was already a delicious soup. We really enjoyed this, thank you! Oh my goodness, this looks so good. Now this is the only thing I’m interested in eating today. Awesome! I love Asian soups but whenever I look up recipes they’re always so complicated, with pig feet broths and obscure ingredients I never have, lol! So I loved this idea, made a version tonight with homemade broth in my Instant Pot with chicken, carrot/garlic/ginger, and shitakes, and then added bok choy, broccoli, and noodles, and all the toppings except the furakaki ’cause I didn’t have any. Yum yum and yum, my 7 year old loved it too! 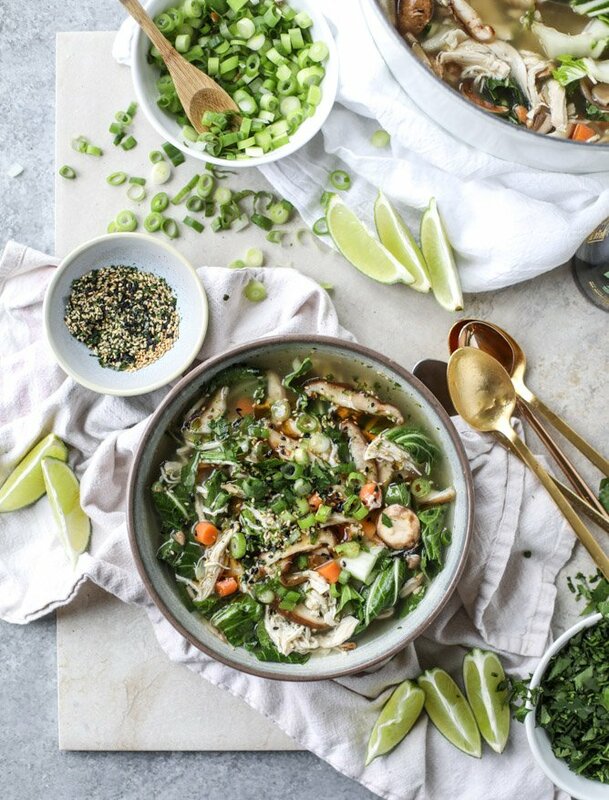 love all of these, and even prefer without the noodles, so kinda glad you forgot, but also that you feel better, yes this certainly looks like it will do the job!Great to have in addition to traditional chicken soup for the flu season, thank you! This was amazing! So yummy and comforting. I made this for lunch today. It just started to snow here in Philadelphia. Two thumbs up from my husband as well! Will have to have my toddler try when he wakes up. I made this soup this past weekend and we liked it a lot. When I made it again, I will have less mushrooms and more carrots and celery. I also added a few slices of fresh jalapeno when I served it. It was as quick as the recipe said and fun to make. I loved the toppings of soy sauce, rice vinegar, sesame oil and cilantro. I made this today and it was amazingly wonderful. Thanks for the recipe…..
Are you no longer allowing pinterest posting? I’ve made this SOOO MANY times (as instructed) and it’s amazing ! Curious about any crockpot tips you could give if I want this but won’t have the time at the end of the day. Toddler… Work… life, etc! Thanks ! Made this last night with some leftover baked chicken and it was fantastic! Wishing I had made a double batch! 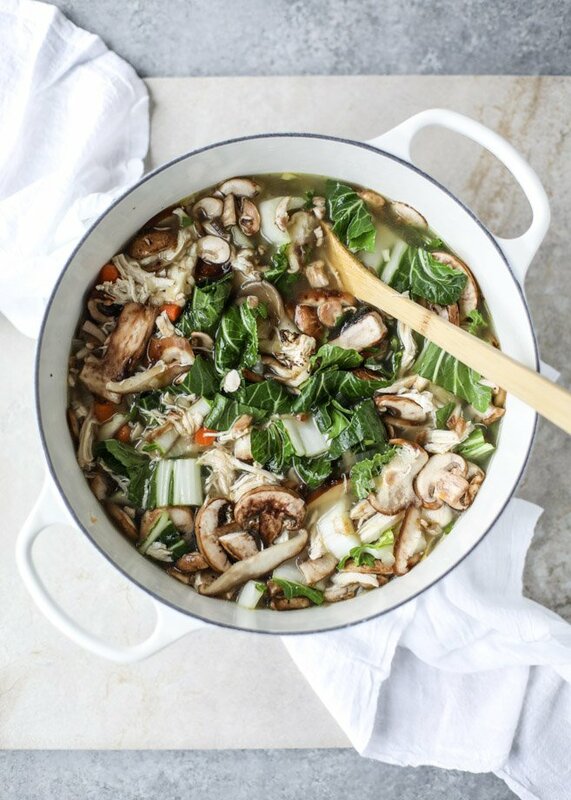 I made this soup all Winter long and it’s fantastic. So much flavor and so comforting. Revisiting this recipe in June Bc I have a summer cold and it’s the only cure! 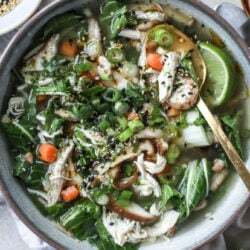 Looks a yummy and delicious chicken soup recipe! Just love it, will try it soon.